Having an annuity is not only a great way to prepare for retirement and generate guaranteed lifetime income, but it also helps provide protection against inflation and other financial misfortunes throughout your lifetime. As times change and people’s preferences diversify, selecting the right annuity for yourself may become challenging with all the different variations and combinations to choose from. Hi, this is Kyle Tomko and welcome back to another episode of Money Script Monday. 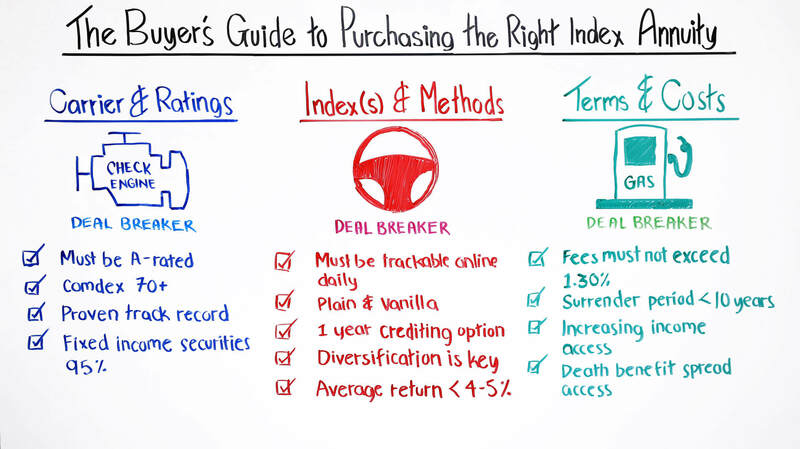 Today we're going to be learning about the buyer's guide into purchasing the right index annuity for you. Now what if I told you that purchasing an index annuity, it has the same process when purchasing a car? Well, let's take a step back and, for example, say you're in the market for one. You do your homework, you identify your needs, your budget and you go to the dealership to purchase a car. Was it a good car for me? Now let's pivot to the financial world where that car is an index annuity and you're in the market for one. Principal protection, tax-deferred accumulation, and income guarantees later on. You decide to carve off a good portion of your portfolio as a bond alternative to cover and protect your retirement in the long run and you decide to find an advisor who can provide a couple different options. Lo and behold, there's a hundred different products out there, there's unheard jargon, and there's a bunch of complex calculations along the way that you're going to experience. Which is why today, we have a list, a buyer's guide, a checklist that can help cross-check your producer to make sure he's giving the best options for yourself and it meets the goals. 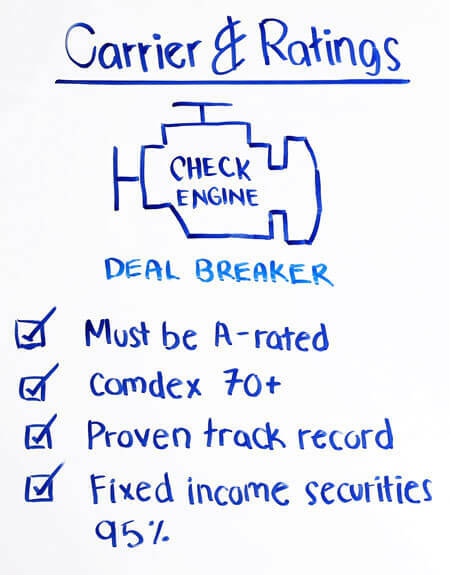 Fortunately, also for you today, the advisor that shared this video with you has access to the same checklist and can beat these deal breakers you're going to learn about shortly. Let's get on to the board here and let's talk about what makes up a good car. Now as you can see, there's three things, there's your engine, your transmission and what we consider fuel consumption. The first one here is the engine and like any good car, without it, it's kind of the heart of it. Without it, your car is just kind of a big, huge metal piece on the side of the road. We want to make sure our index product is just as good as the issuing company, one that's strong financially, one who has great claimability, debt obligations to repay, and has strong carrier ratings and Comdex scores. And we have a couple of dealbreakers here that I listed that you should make sure your index annuity falls upon and if not, reconsider. A-rated. There's a couple different agencies out there, there's the Fitch, Moody's, S&P and the A.M. Best. You want to make sure they're A-rated, they go from A to D, but obviously, the stronger ones will be the ones that have an A and above on that. The Comdex score. It's actually not a rating, it's a ranking from 1 to 100, and in this case, the dealbreaker's at 70. Typically, we like to see them up in the 90s, but there's obviously a wide list and we want to make sure it's at least over 70, so you're in a good product. Proven track record. We want to make sure during the '08 crisis, they weren't downgraded, they weren't overleveraged like banks were. Not one insurance carrier actually went bankrupt during the '08 crisis and that's just something, another thing to consider, how strong these insurance companies are as they're really the backbone of the country. And then lastly is the fixed income securities. We want to see at least 95% investment grade and nothing below that. Let's move on now to the transmission and what we consider the indexes and the methods. And there's hundreds of different indexes out there. There are 17 different crediting methods and there's about 700 different variations between the two. And we have indexes being created by thin air every single day now, it seems like, and so we kinda refer back to our 20-second test. And you should try this with your producer. If the producer can't explain the index in 20 seconds and how you're going to earn interest, you need to move on. And you want to be as transparent as you can, you want something that's plain and vanilla, something that's tried and true. And something that isn't a "trust me" product. You don't have to rely on all the different moving parts that the insurance carrier's marketing just to get those rates a year later. 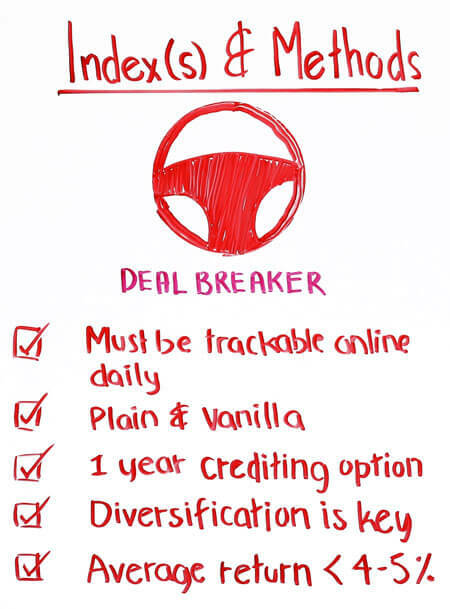 A couple dealbreakers here, is it must be trackable, daily, of course. We want to have access to that and how we're earning interest, unlike whole life. Plain and vanilla, tried and true like I mentioned earlier. We want to have a one-year crediting option typically so we can not have to worry about waiting two or three years like a couple others that are out there today. Typically, over a five-year period, you're going to have three good years, one down and one flat, so you never want to chase different index and crediting options. And in terms of illustrated rates, index annuities were made to kind of compete with CD-like returns. If they're illustrating over a 4% to 5% average return, red flag and you should tell them to reduce that to be a little bit more conservative. Let's move over to the third part here, and this is what I call fuel consumption. You want to make sure that your product is efficient, you want to make sure your car is efficient, and you don't want it to eat away at your wallet or eat away at the gains. And this is where the terms and the costs come in. We want to strip down all the costs. We want to make sure that our fees are as low as possible, we want to make sure the surrender charges are not over 10 years, because typically when they are, commissions are a bit higher. You never want to really lock yourself up longer than that. Income riders. Typically, you're paying 1% to 2%, so anything over 1.3% is something, again, another red flag. What I always like to say is, you never wanna put a tractor on a Ferrari. And one of my colleagues always mentioning that and that's true to the fact where if you're looking for income, it's kind of treated as a commodity. You want to shop that around the different products out there and make sure that it's delivering what your initial goal was. 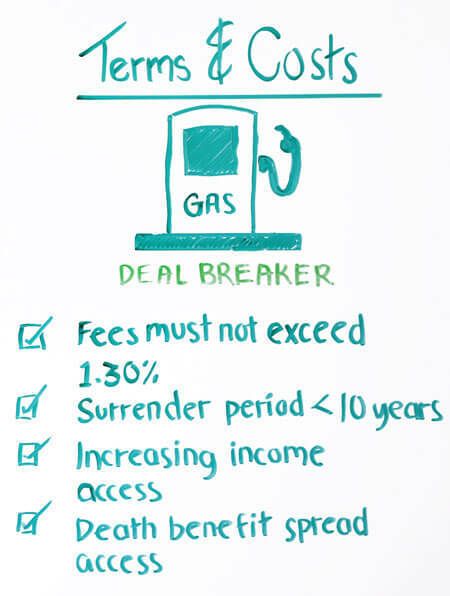 Those deal breakers as I mentioned, we want the fees to not exceed 1.3%, we want the surrender periods under 10 years, we want more than 1 income payout. A lot of times, level income is the best for older-type clients but if you're looking for increasing, it can compete with inflation, and it can actually provide more projected hypothetical growth in the near future. Death benefits, spread option, again, back to the traditional way. The death benefit would be paid in a lump sum. A lot of carriers, the innovative ones, are spreading that over a five-year period so it doesn't create as much tax liability on the beneficiary today. As you can see, we walked through the three different checkpoints, three different guidelines. We want to make sure we have strong carrier ratings and a strong engine where you can actually request vital signs and ask your advisor to do that and he will, and pull those financial reports, those report cards to really see how financially backed it is. We want to make sure our indexes, they're simple, they're transparent, that you could trace them, you could track them. And then lastly, we want to make sure that it's efficient. We want to strip down all the costs, we only want one layer of fees and, again, we are able to ask your advisor to run an expense breakdown, an expense analysis and we can show you what hidden fees you're paying for. And I wanted to thank you again today for tuning in to these guidelines and hopefully, whether you're looking for an index annuity or you have one already. You can reach out to your financial advisor to run a couple different options that meet these guidelines and pass these deal breakers, and thanks again for tuning in today. 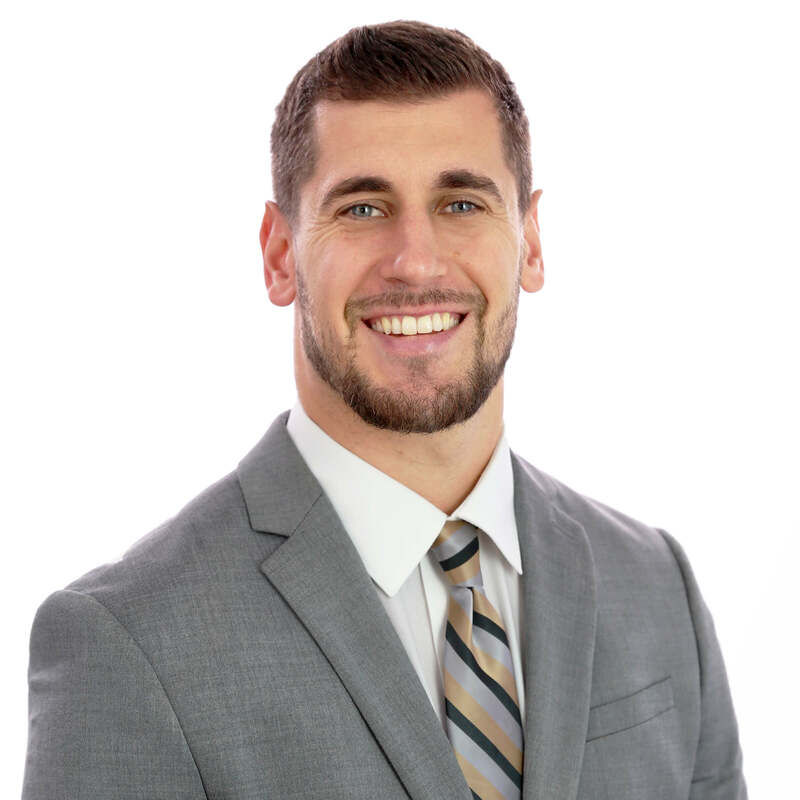 Kyle Tomko is a Field Support Representative at LifePro. He coaches hundreds of financial professionals on how to build effective financial strategies that achieve their clients' long term goals and helps them stay educated on the latest industry trends.